Thang-ga is a Tibetan word which refers to the scroll painting mounted with colorful satins and fabrics. 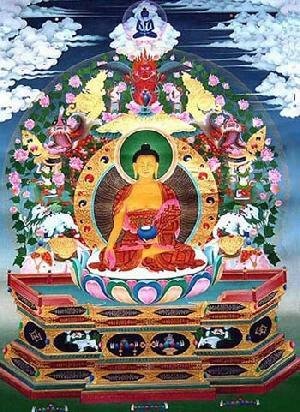 It is the religious scroll painting hung in the hall for the Tibetans to worship. Thang-ga is famous for its florid color and takes traditional non-ferrous ore as the raw material. After the painting is drawn and mounted, colorful satins will be used to connect the frames as decoration. All the dye of Thang-ga is made manually. And because of the high pureness, strong covering capability of the dye, the painting will have gorgeous color and can be preserved for one thousand years without any change in color. Thang-ga is usually hung in palaces, temples, folk houses, and pray halls of the manors in Tibet. Thangka paintings feature a wide range of subjects, which can be roughly divided into the following categories: Buddhas and Bodhisattvas; biographies of buddhas; Tantra, Istadeva and all relevant gods; Goddess of Mercy; Buddha-protecting gods; the great kings; eminent monks and those with great achievements; Tibetan history and historical figures; altars and Buddhist pagodas etc. In addition, motions of celestial bodies like the sun and the moon, Shambhala, Mount Xumi and metempsychosis etc are also featured in thangka paintings.